When the sun is shining and you feel like heading outdoors, there's no better place to spend a day than a beautiful beach. As your feet sink into the sand and the sound of crashing waves fills your ears, you really feel a million miles away from the mundanity and stresses of regular life. Beaches offer the perfect getaway at any time of year, letting people simply sit back and relax for a few hours or a full weekend. They also offer all kinds of opportunities for outdoor recreation, including activities like surfing, swimming, snorkeling, and beach games like volleyball. There are plenty of great beach towns and cities all around the United States, but if you live in California or plan on visiting the state, you'll have a particularly long list of exceptional beaches to choose from. Santa Barbara is one of the best beach cities in California and everyone who visits the city has their own favorite spots. Whether you're looking to simply lie back and read a book, enjoy a picnic with the family, or head on the waves for some swimming or surfing fun, Santa Barbara will have a beach for you. Since Santa Barbara has so many awesome beaches to choose from, it can be quite hard to narrow down your search and pick just one of them. That’s why we’re here to help. We’ve taken a look at all the big beaches around the city and highlighted some of the very best. Read on to learn all about them and be sure to visit a couple on your next Santa Barbara trip. 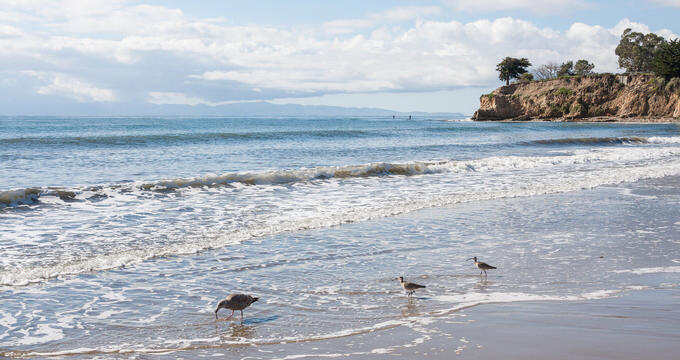 Located in Montecito to the east of the city, right by some fabulous upscale resorts and the vibrant Coral Casino, Butterfly Beach is one of Santa Barbara's most naturally beautiful spots and it's a super place to visit at any time of year. Even on cloudy days, it can be nice to simply walk along this Santa Barbara beach and admire the views. You don't even need to actually head onto the sand itself to appreciate this beach, as there's a nice rock wall lining the edge of it and providing an ideal spot to sit down and relax. Many of the city's beaches are south-facing, but Butterfly Beach looks out to the west, meaning it's a nice spot to come early in the mornings in order to admire the sunrise while most of the city is still sleeping. Situated in the local town of Carpinteria, Santa Claus Beach isn't known as a top tourist spot, so the crowds never get too big at this location, making it a nice fit for families or groups of friends that are looking for a little privacy and don't want to be drowned out by the noise of hundreds of other beach-goers. This oddly-named beach has a lot of good amenities like eateries and beach equipment rentals, and you can park for free on the local streets too. The area gets some nice waves for surfing, but there are gentler days too, offering nice conditions for younger beach visitors to do some paddling and splashing on the water's edge. Paddle boarding and swimming are popular here too and the sand is especially soft. Also located in the local town of Carpinteria, which can be found just a long hike or short drive out of Santa Barbara, this beach is a big hit with families. The waters are very calm here compared to other Santa Barbara beaches, offering just the right conditions for families to head out and do some swimming together without having to worry about the little ones. There are some picnic tables and restrooms at this beach too, and it's a good spot to look out for all kinds of wildlife. The local town of Carpinteria has some good shops and eateries to make your day complete. A very popular beach spot with Santa Barbara locals, Leadbetter Beach is a great spot for surfing and swimming. It's a very pretty beach with a lot of useful amenities, including BBQs that tend to get claimed quite quickly on warm days, so it's a smart idea to arrive early if you want to grill up some burgers. If you miss out on the grills, a nearby restaurant offers some great food and there are restrooms and outdoor showers for public use as well. As this Santa Barbara beach is quite popular, there's always a lively atmosphere here, so it's a nice spot to come on special occasions or summer weekends. Just a little way south of Santa Barbara, Summerland Beach offers a lot of space and is one of the area's best kept secrets. Not too many tourists know about this beach, so it never gets overly crowded, resulting in a quiet atmosphere where beach-goers can really listen to the waves and appreciate the tranquility of the day. A kids' play area and picnic table can be found here, along with showers and free parking zones. This particular beach is very open, with few shady spots, so you might want to bring a beach umbrella along or remember to wear hats. One of Santa Barbara's true hidden gems, Mesa Lane Beach is totally unknown to many travelers in the area, but as soon as you step foot on this beach for the first time, you'll want to come back again and again. Getting onto the beach is a bit of a challenge, however, as you'll have to walk all the way down a very long staircase on Mesa Lane. You'll also have to walk all the way back up at the end of the day, so be sure to save a little energy for the return trip. The views on Mesa Lane Beach are simply extraordinary and it's a breathtaking spot to lie back and do some sunbathing.